I’m a little late getting this post written. Art Wynwood was over a week ago but it’s still on my mind. For the most part I was not impressed. Much of the art was recycled from Art Miami which was not that long ago. So two things excited me. 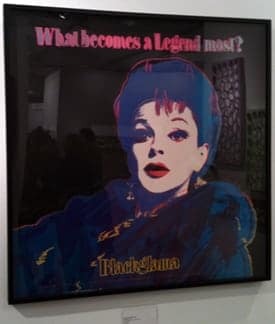 First I saw Andy Warhol’s Judy Garland from the Blackglama ad Campaign. 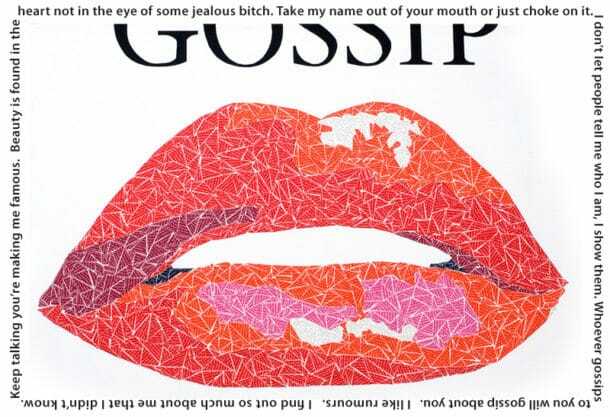 I worked at the ad agency that created these original ads and it brought back memories. I was an assistant to the Art Director and usually bought the shoes for these ads. No other styling was required. I knew that Warhol did his “What becomes a legend most?” but I had never seen it. It was the highlight of the evening for me. I also found the work of Augusto Esquivel to be exciting. 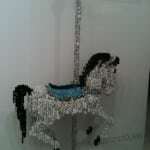 His sculpture is done with buttons strung on clear wire. In his words, “Like an atom in a molecule, each button serves and shapes the whole”. Visit his site to see more of his work.